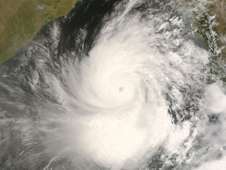 (PhysOrg.com) -- NASA satellite data and a new modeling approach could improve weather forecasting and save more lives when future cyclones develop. About 15 percent of the world's tropical cyclones occur in the northern Indian Ocean, but because of high population densities along low-lying coastlines, the storms have caused nearly 80 percent of cyclone-related deaths around the world. Incomplete atmospheric data for the Bay of Bengal and Arabian Sea make it difficult for regional forecasters to provide enough warning for mass evacuations. In the wake of last year's Cyclone Nargis -- one of the most catastrophic cyclones on record -- a team of NASA researchers re-examined the storm as a test case for a new data integration and mathematical modeling approach. They compiled satellite data from the days leading up to the May 2 landfall of the storm and successfully "hindcasted" Nargis' path and landfall in Burma. "There is no event in nature that causes a greater loss of life than Northern Indian Ocean cyclones, so we have a strong motivation to improve advance warnings," said the study's lead author, Oreste Reale, an atmospheric modeler with the Goddard Earth Sciences and Technology Center, a partnership between NASA and the University of Maryland-Baltimore County. Cyclones in the Bay of Bengal - stretching from the southern tip of India to Thailand - are particularly difficult to analyze because of "blind spots" in available atmospheric data for individual storms, as well as the small dimensions of the Bay, which ensure that storms do not have much time to develop or circulate. In most instances, regionally strong wind shear suppresses cyclone development. But when tropical cyclones do form, flooding waves and storm surges can quickly reach the narrow basin's shores. And that unusual wind shear, which is fueled by large temperature contrasts between sea and land, can also lead to erratic storm tracks. Forecasting is also made particularly difficult by the "blind spots," Reale noted. Land-based weather stations monitor the edges of the bay, but they cannot see much when a storm is brewing several hundred miles from the coastline. Forecasters from the India Meteorological Department and the U.S. Navy's Joint Typhoon Warning Center lack access to the fleet of "hurricane hunting" airplanes that fly through Atlantic storms. They have to rely on remote satellite measurements that can only assess atmospheric and ocean temperatures under "clear-sky," or cloudless, conditions -- not exactly common in the midst of a cyclone. In their modeling experiment, Reale's team detected and tracked Nargis' path by employing novel 3-dimensional satellite imagery and atmospheric profiles from the Atmospheric Infrared Sounder (AIRS) instrument aboard NASA's Aqua satellite to see into the heart of the storm. In 2007, atmospheric scientist Joel Susskind of NASA Goddard Space Flight Center, Greenbelt, Md., successfully demonstrated through a technique developed by NASA research scientist Moustafa Chahine that accurate atmospheric temperatures could be obtained using real (versus hypothetical data in a 2003 Susskind study) AIRS partly-cloudy data. Reale's team used the temperature data products from Susskind's work to run the NASA model with the added information from partially-cloudy areas of sky that traditionally got left out. 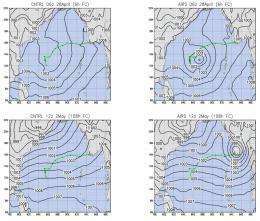 Lau, chief of Goddard's Laboratory for Atmospheres, believes that regional forecasting agencies monitoring the region can readily access AIRS' data daily and optimize forecasts for cyclones in the Indian Ocean. According to Lau, the same technique can be useful to forecasts of hurricanes in the Atlantic and typhoons in the western Pacific, particularly when the storm is formed over open oceans out of flight range of hurricane-hunting airplanes.